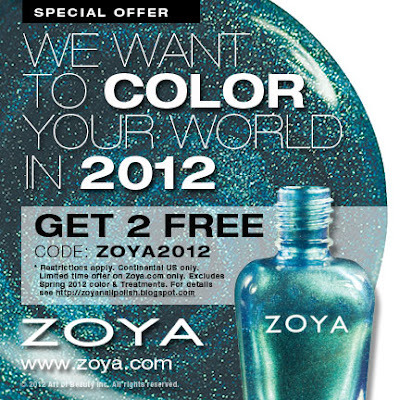 That's right, Zoya is kicking off the new year with a promo and I just had to share! That's right, you get two nail polishes for free (all you have to do is pay shipping). You can also add $25 to your purchase and you get free shipping. This promo lasts until 1/9/12 so you have some time to pick out the perfect colors. Oh and if you need any suggestions on colors...just shoot me a message or comment!